Today Mayor McGinn signed Seattle’s new paid sick leave ordinance into law at Capitol Hill’s Plum Bistro. 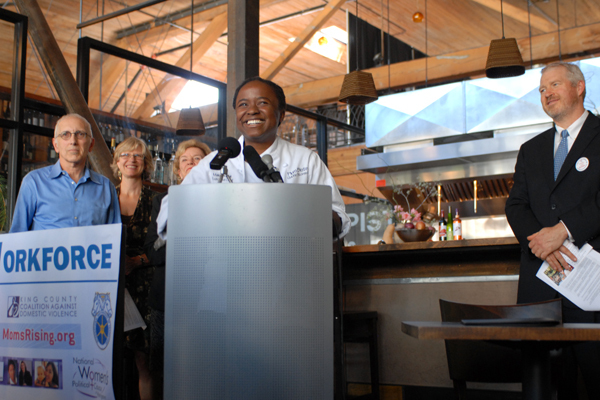 Plum Bistro’s owner Makini Howell [pictured below] was one of the first Seattle business owners to get involved in advocating for this legislation. This law will level the playing field in Seattle by supporting public health and economic justice. 84% of the highest paid workers nationally have access to paid sick leave. But only 32% of the lowest-paid workers have this benefit. They are denied the opportunity to care for their families and care for themselves. This entry was posted in In the news, Paid sick days. Bookmark the permalink.